If you haven’t had a chance to review the Straw Bale Minute video series, I highly recommend that you take a look and see what’s available. I made these videos a number of years ago, but the information within them is still valuable and accurate. I cover all kinds of topics and each video, as per the name of the series, is short and to the point. Even though the series is called the straw bale minute, some of the videos are slightly longer, but not by much. I’ve included the top three most popular Straw Bale Minute video topics below with links to each video included. For information on estimating what your straw bale house will cost, please click here to view the Straw Bale Minute titled “StrawBale.com: Initial Cost Estimates”. In addition to the Straw Bale Minute video series, I also have a bunch of videos that cover topics in more depth or show “on site” construction details. These videos are longer, but nothing that you can’t watch in one sitting. The longest video I can think of is around 15 minutes. 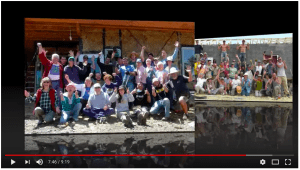 If you’re wondering if our straw bale workshops are for you and are looking for something to inspire you about attending, please check out this great video, and/or this one. You can even get a glimpse into an actual workshop I did last year in Sierra Vista, AZ. I did a daily video summarizing the work completed each day and shared it LIVE on Facebook (and now hosted on YouTube). It’s a fun way to see just how much we get done in a day. You can check out those videos, starting with Day 1, by clicking HERE. Speaking of which, if you’re interested in attending a workshop this year, please click HERE to see what dates and locations are still available. We tend to sell out often, so be sure to check soon. 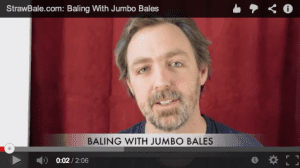 The Straw Bale Minute series has over 50 individual videos that cover pretty much every topic I’ve received numerous inquires about over the years. If you don’t see the answer to a question you have in the series, please let me know by emailing me at Andrew@StrawBale.com. If I get a few inquiries about the same topic, I’ll make a video to cover it as well and will post it to YouTube and StrawBale.com. we are interested in filming for tv a hay bale home under construction, the more unusual the better. can you connect us to a home owner ? Hi Andrew & Rachel, I have 98 acres in southern Missouri and believe in using metal fasteners and the 2”x2” wire mesh for shear strength but am concerned about the moisture buildup to the metal and causing problems over time. I’ve thought that a solution may be to paint a coating onto all the metal surfaces as a barrier. Or, has your experience been that it’s not a moisture issue once all plasters are in place. Thank you for your expertise. Hi Richard. Thanks for your message. I have not seen any issues with moisture from the mesh or metal fasteners. The mesh is in contact with the plaster, which is hygroscopic, and pulls any excess moisture away from the bales. The metal fasteners are so small in relation to the rest of the structure that they too do not pose any issues. They do, however, help you build a house that will last for many years. Have fun! Hi Steve. I don’t know anyone currently building that would want a film crew on board. Sorry I can’t help with that. I was looking at your page and saw the system of bales on the roof!! I think this is recent because at your CD’S did not show it. Hope you can visit us it would be a great pleasure to host you. Hola Ignacio. Gracias por su invitación. Yo y mi esposa vivimos en Loreto por mucho del año ahora. Nos encantaría venir a visitarlo uno de estos días! Gracias, una vez más, por la amable invitación.